Why don’t you design your own style with the Philips Styles shaver? With a simple flip of the wrist, this dual-ended electric shaver and beard trimming machine comes with everything you need to come up with a style from stubble, a styled beard or a clean shave. It is also dual trimmer, just imagine. The entire unit measures about 32 millimeters, and also comes with a 12 adjustable length settings which makes it easy to get the perfect length that you wish. There is also the zoom wheel that allows you to lock in your perfect length setting when trimming your beard. There is also a durable metal trimmer that is extremely skin-friendly and it also guarantees a precise and even trim. The new dual foil shaver makes it easy for you to shave around your face. This mid-trimmer also catches longer and tougher hairs as well as the 2 floating foils clear everything else perfectly smooth. To use the electric shaver, you only need to remove the adjustable comb and you will see a full metal, dual sided trimmer below the unit. You can use both the 15-mm side as well as the 32-mm side for a high-performance trim for precise detailing work in those hard to reach spots. The rounded tips also make sure that there is a smooth touch to your skin. The finer cutting components deliver a close trim with the best results — excellent for finer details or places such as around your mouth or under the nose. For maximum shaving results and smooth cleaning, ensure that you use a gel or foam if you are using the shaver while wet, but you can also use it to dry. You do not necessarily need to use gel or foam when you shave, and it is built for any situation. When you have finished, rinse the machine under the tap to clean it. The Lithium Ion battery can stay on for about fifty minutes of powerful cordless use and you can charge too full in only four hours. The zoom wheel allows you to adjust the comb in the 12 length settings. The settings start at 5mm and go up to 10mm with steps of a half millimeter to define everything you need. In addition, for longer beards, it gives you the lengths you want in 1-mm step sizes. The light is continuously lit to indicate a full battery, and blinks orange when you have about 10 minutes of usage left. The electric shaver has a foldable stand for convenient charging and storage, and the charging stand offers you convenience as well as flexibility when you are travelling. In addition, you get a two-year warranty when you purchase. The Philips QS6141/33 Electric Shaver and Beard Trimmer is built to last for as long as you use it. You also get worldwide voltage compatibility with the adapter in the package. The metal trimmer features sharper edges for more effective performance. The beard trimmer is uniquely designed to give a closer trim even in the parts that cannot easily be reached. It is currently selling for around £50, and has an average review of 3.8 stars out of 5. 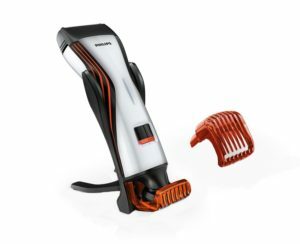 This electric shaver and beard trimmer has some lower overall reviews then others out there, but comes in cheaper than some of the higher rated ones out there.